Yesterday was a day of inspiration in a way I wasn't expecting. We boarded an express train in New Brunswick, making a speedy trip into the city and to the Metropolitan Museum of Art. Entering the building as members, Katie and I bypassed lines, received discounts in the Met Shop and felt very entitled. We met up with our camp friends and spent most of the time in the galleries catching up with each other. The rooms created a beautiful backdrop for our conversations and I glossed over many works of art, making a second trip or possibly even a third trip, now necessary. I am a member after all. That will not be a hardship. On this day, even as I was often tempted to run over to every framed masterpiece dancing in my peripheral view, I was even more excited to talk with Vicki and Ruth. My favorite painting of the day was a pair of shoes by Vincent van Gogh. Worn-out shoes that cradled his feet sat on the floor of this painting, more touching than any other self-portrait in the room. This was Vincent. He wore those shoes. 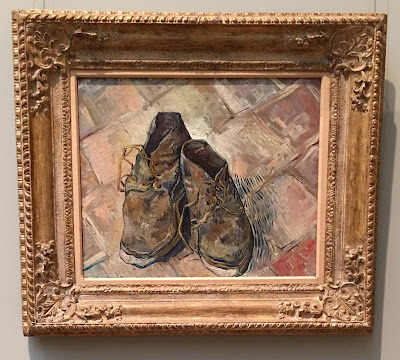 He was in that room painting those shoes and these are the brushstrokes he used to immortalize his existence. I did approach this canvas. I did stand mesmerized in front of it (and a few others) to breathe in his talent. Beautiful Vincent. My favorite exhibit of the day featured the Gee's Bends Quilts. 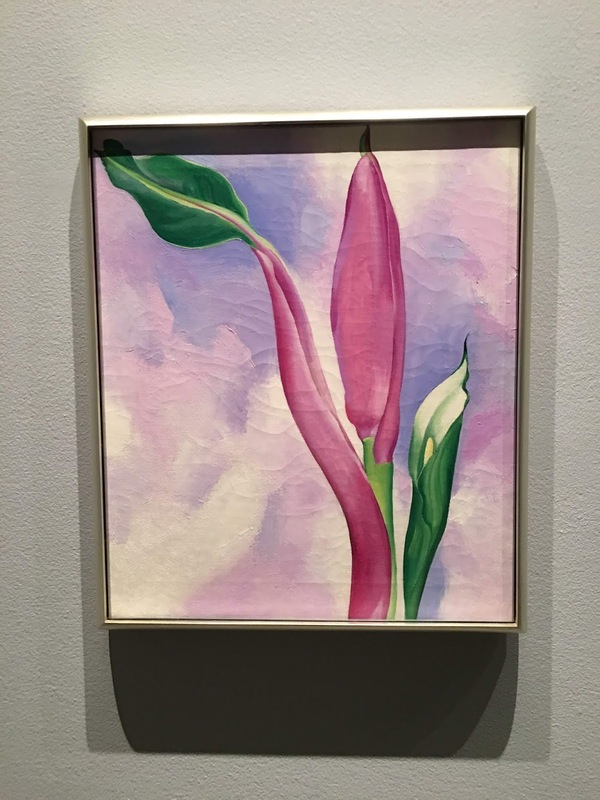 In this gallery, I was able to find my inspiration. I've seen many photographs of these quilts online, but never actually saw one up close. I have not mentioned much about quilting in my journaling; this hobby is neither a summer hobby nor an obsession of late. 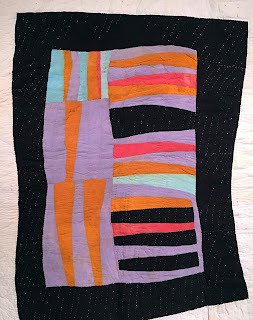 Except for placing one of my quilts on the back of a chair in my studio or napping under another quilt in my air-conditioned house, I have not thought much about them at all. In my creative floundering, I always go back to sewing because I love textiles. And I will most likely return to sewing as soon as I find my balance as a retired person. I love fabrics and I fell deeply in love with quilting. The Gee's Bends exhibit at the Met reminded me of that. The women from Alabama who created the quilts on exhibit in the Met never saw abstract paintings in a museum. People have mistakingly commented that the influences of abstract art permeate these patched quilts. Are folks trying to validate these quilts as art simply by comparing them to trends of male artists in the art world? The designs we admired in the gallery were traditional designs passed down through generations of women. 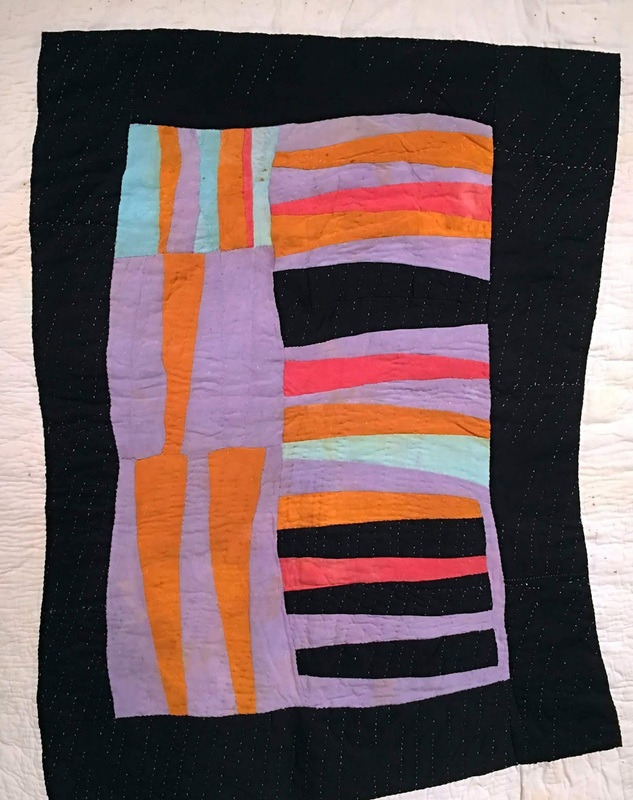 They were not born out of the work of abstract painters, but out of a quilting tradition. These women did not have a membership to a museum, they did not have access to a fabric store, a rotary cutter, or possibly even a sewing machine. The hands that pieced bits of fabric left over from their family's working clothes into remarkably beautiful designs are visible in every stitch. 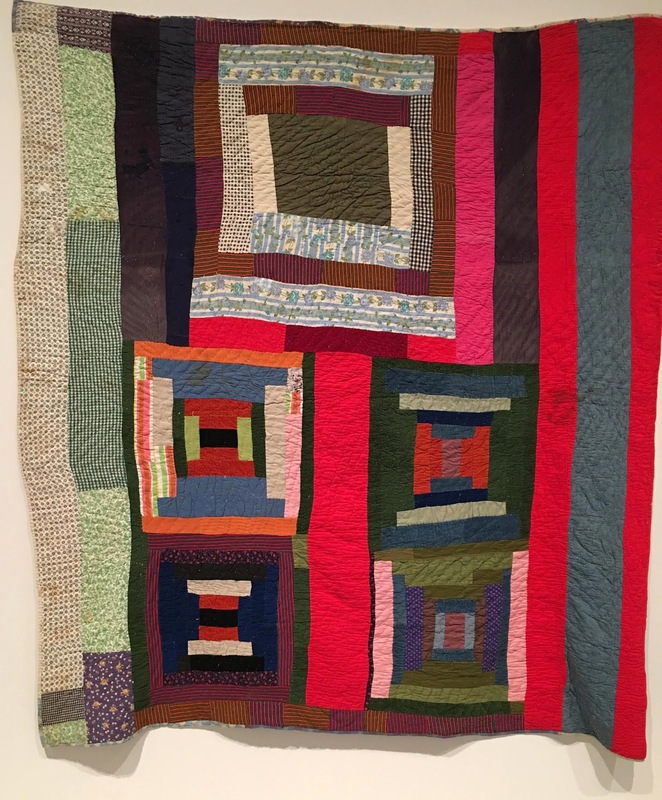 Their quilts were never expected to be the inspiration for anyone in a museum. They totally wowed me and my gallery mates and successfully directed our conversations to the art on the wall. 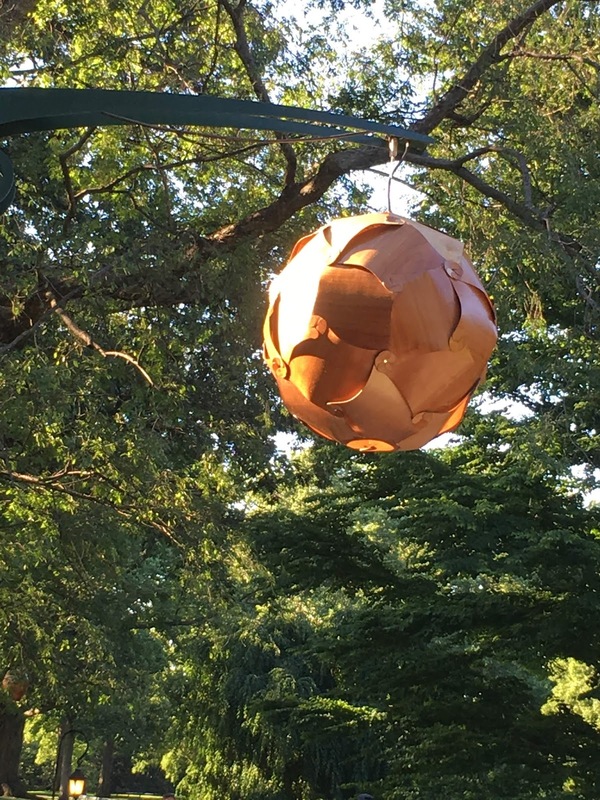 This morning, I read a blog post by Becka Rahn, called, "You're Not Doing Art Wrong." For me, great art is the kind that makes you have a reaction... you looked at it, listened to it, or read it and it caused a reaction. The piece that I make a connection to, isn’t going to be the same one that you make a connection to and it won’t be in the same way. 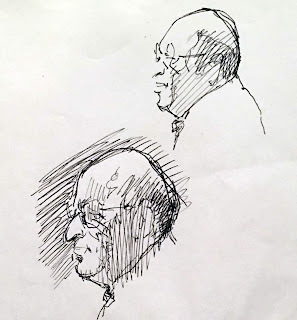 Because connections take two people: the artist and the viewer. ... Sometimes you just need to hear someone else say it. You aren’t doing it wrong... You don’t need someone to tell you that you are making great art for it to be great. It’s going to connect in amazing ways with some people and fizzle with others. That’s what great art does. Her words hit home today. The day after my day at the Met. Thank you Abby Glassenberg for your link to a new blog. My direction with my art and with my choices for retirement aren't wrong, they are just mine. Becka's written pep talk connected with me in a very right way. Just as my conversations that may have had little to do with the art in the museum connected with me in a very right way. It was a perfect day to be inspired. Thank you, Katie, Vicki, and Ruthie. 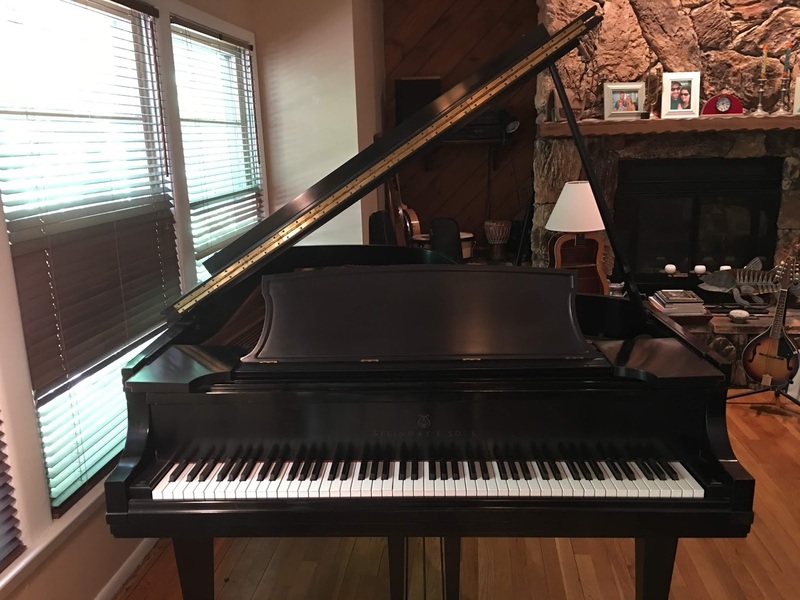 Today, our Steinway piano leaves the house, sold to the highest bidder by Dot. I woke early this morning, ready with a title for this essay and a mind filled with words too scrambled to do justice to the scope of my emotional feelings. Dorothea Lippart was the music teacher at Ranney when I began teaching. Dot is a talented and lovely person, a beloved mentor to every young student who ever had the honor of working with her, and a very generous friend. Just over six years ago, Dot retired from Ranney life and was planning to move from her beautiful, antique filled home in Rumson, NJ. Two grand pianos sat together in her tight first floor living room, a house of a true musician. The pianos were eventually going to be gifted to her two sons one day. Meanwhile, she was not going to her new home with both pianos, and asked if anyone would be willing to hold one of them until her son, James, was ready to take it. We went with Sam to her house to see the piano. How thrilling for Sam to play on a real Steinway, a beautiful grand lady meant to fill the concert halls of the world with music. It was an ordeal to bring the Steinway home. Piano movers removed her base and wheeled the body of the piano up the steps on its side. We delegated all the furniture in our living room to the garage to make room for her visit. Only a couch and a chair remained, comfortable seats for an audience to enjoy her sound. We sat around the Steinway for the last 6 years, simply kvelling at Sam's gift of a piano and his gift of musical talent. Sam's post on FB the day the piano came was a proud and excited blurb. 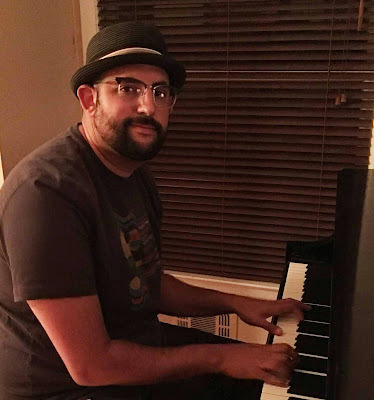 He learned to be a musician on a Howard, a used upright piano too old to be tuned properly. That day, he began playing on the concert grand Steinway. Quite a change in status and quite an honor for our young, talented musician. Sam composed the score for an original musical on the Steinway and wrote a CD filled with original songs on the Steinway. He made us smile with his music, filled our home with magic, and entertained scores of friends and family on the Steinway. He was gifted with the best keys and the best sound for many years. Today, movers are coming for the Steinway, taking it to Virginia to be restored and sold. Dot's son, James, did not want the piano after all. I painted a canvas for each of my family members over the years. They all own an original B Levine and a very precious piece of my heart. For Sam, the painting that hangs in his room is a realistic composition of his fingers on the keys of the Steinway. I must have taken over 50 photos of his fingers on the keys, all with a good view of the Steinway logo above his hands. I remember asking him which photo he liked best, as I know little about music and which keys he was pressing to give him which sound. A true collaborative effort, an image of Sam was selected by Sam, then painted by me. I have done many paintings in my life and not all of them have dogs in them. This is one of my favorites. The piano moves into a new home today, but my painting of Sam's fingers on the keys remains as an homage to a grand lady who filled our living room with beautiful music. I am thrilled that he has my gift of a painting to always remember his gift of music from Dot. Sam will own another piano one day, whenever he is ready to choose one for himself. 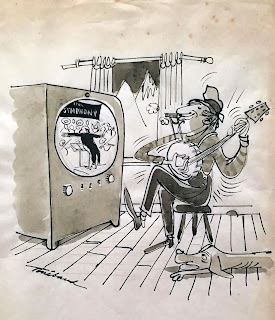 Right now he proudly plays on a grand electric keyboard, various guitars, ukeleles, drums and assorted other instruments. He graces the halls of his school and the courtyard of his camp with his talent. He amazes audiences and totally captivates his proud parents no matter what keys or strings tickle his fingers. Can someone find him a microphone, please? 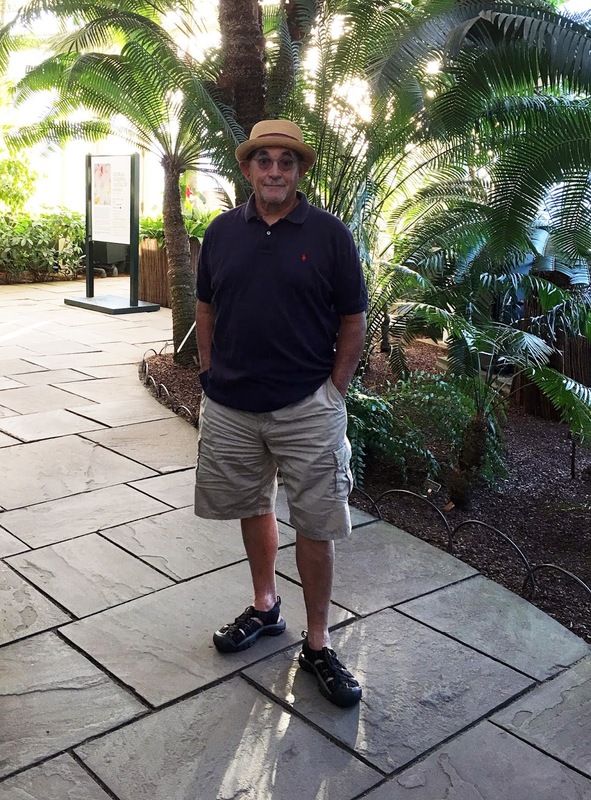 One month as a retired art teacher. Thirty days. I have to be thankful that each day has been filled with things to occupy my mind and has kept me physically moving. Zach and Michele are officially engaged and a date is set for their wedding. I bravely faced retirement with a rush of emotions and busy work. I cleared out the overstuffed basement to make room for more stuff, hosted barbecues to welcome in the summer with friends, completed two paintings, sold one for cash, went to a few art exhibits for inspiration, enjoyed a few beach days with Norman, and helped Joyce build shelves. Phew! All of this has made the transition from working a full job to not working a full job easier. And, it does not feel like I am not working a full job. I am just as exhausted come nightfall. 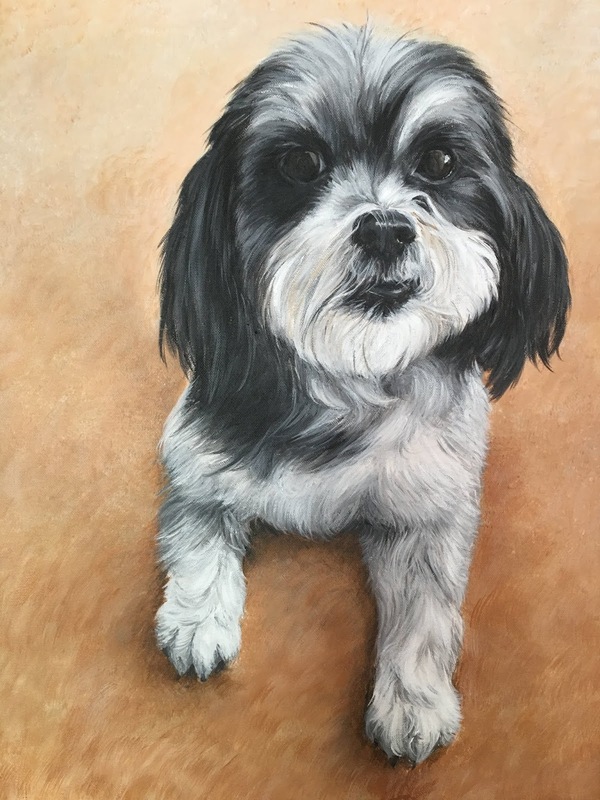 I completed Maggie, my eighth dog portrait. I am ready to design a website to sell my work. People love their pets. I can do this. 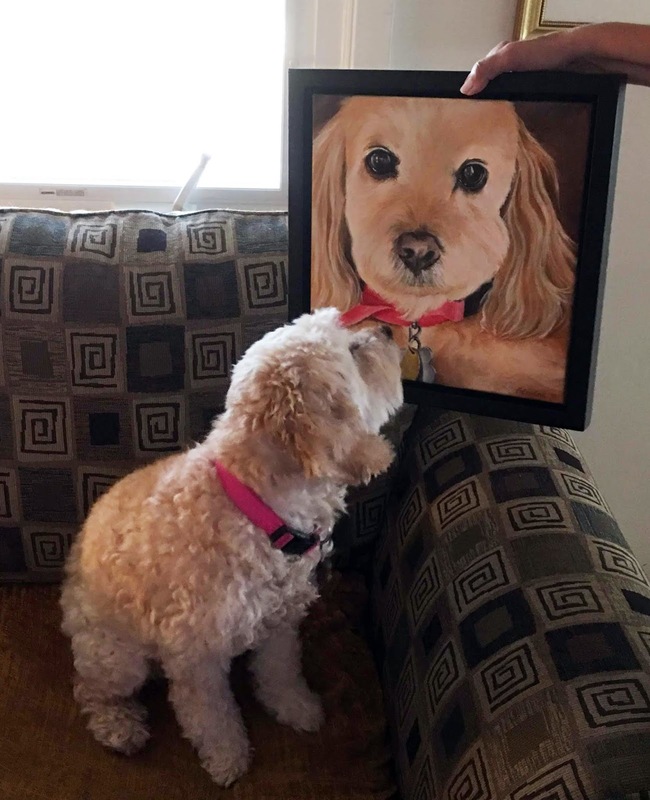 After one dog portrait, I could say I am a painter. 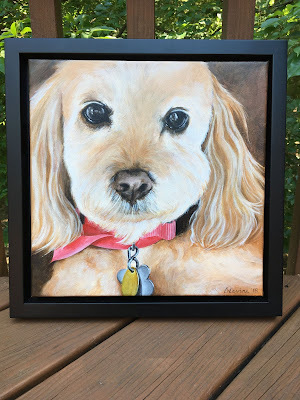 After eight dog portraits, I can say I paint dogs. Right? I felt so grateful to be able to work in my own art studio this month, perfecting the details of her collar and dog tags with the tiniest brush imaginable. Maggie's eyes shined brightly on the canvas and her fur seemed soft and real. She was coming alive for me and I was living my dream. Maggie is now signed and framed, and lives in her new home with the Bubers, along with the real Maggie Goldstein. Here are my eight completed dog portraits, all painted with love and hopefully displayed with just as much affection in the many homes they live in. My Murray, you are next. I just enjoyed a great day of inspiration for any artist. My trip to the city was a lonely one, but it was a trip I was happy to do for myself. 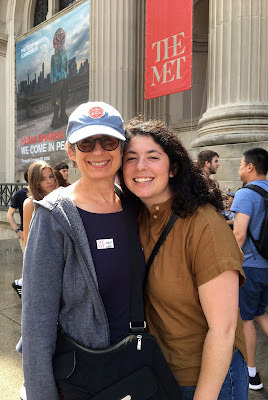 If an exhibit looks promising, the weather fair, and no other pressing needs were keeping me home, why wouldn't I make the $6.80 senior fare bus trip into Manhattan? I tried reaching out to a few friends to meet me at the Morgan Library and ended up on my own, having just as much fun talking to strangers in each of the galleries of the Museum. 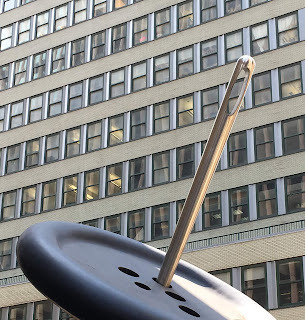 I love discovering art on the streets of Manhattan. This oversized needle was a surprising find on a corner of the garment district. My brisk walk to the Morgan Library on Madison Avenue was filled with thoughts of a few exhibits I was excited to see. Street art along the way made the day all the more special. At the museum I started my self guided tour with the sketches of Thomas Gainsborough. 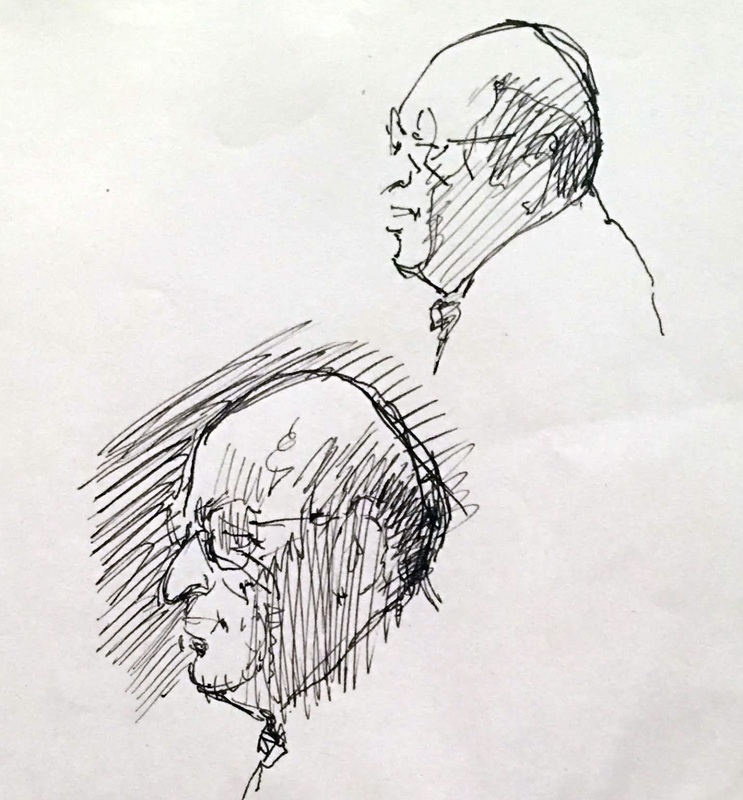 His sketches resemble the style of his paint strokes. 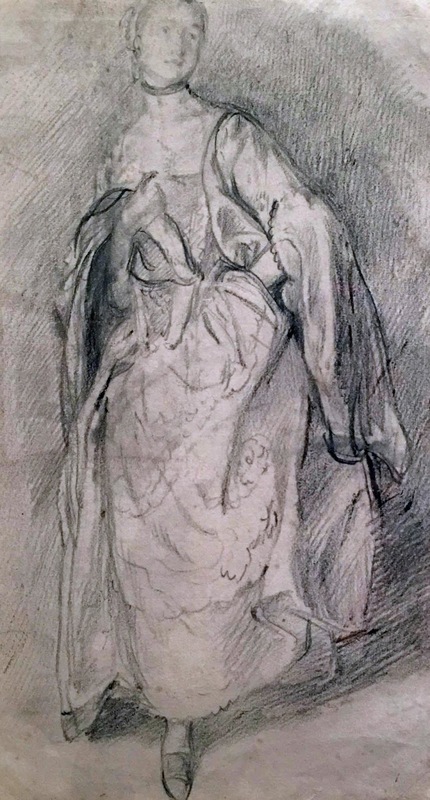 I discovered the same startling comparison years ago in an exhibit of Vincent van Gogh's drawings. Vincent's small repetitive marks of pen and ink in his drawings were a perfect match to the small directional strokes of his paintings. I remember thinking this was obviously how Vincent visualized the world and expressed his observations. It was just as startling to remark on the same fluidity of work with Thomas Gainsborough. Do my drawings look like my paintings? I'll have to think about that. 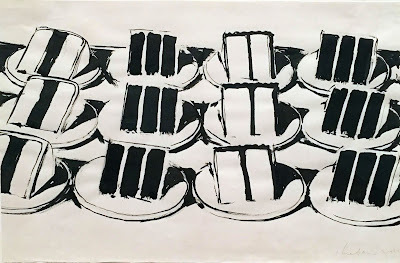 The next room I visited at the Morgan featured the drawings of Wayne Thiebaud, an artist famous for painting cake. I meant to teach this artist to my art classes and never got around to introducing him to the kids. How much fun would it have been for them to paint a picture of cake? Without planning a lesson on the artist, I never did the research or learned much about him. Turns out he was a draftsman and a cartoonist before he ever painted cake, and this exhibit clearly was not about his paintings. 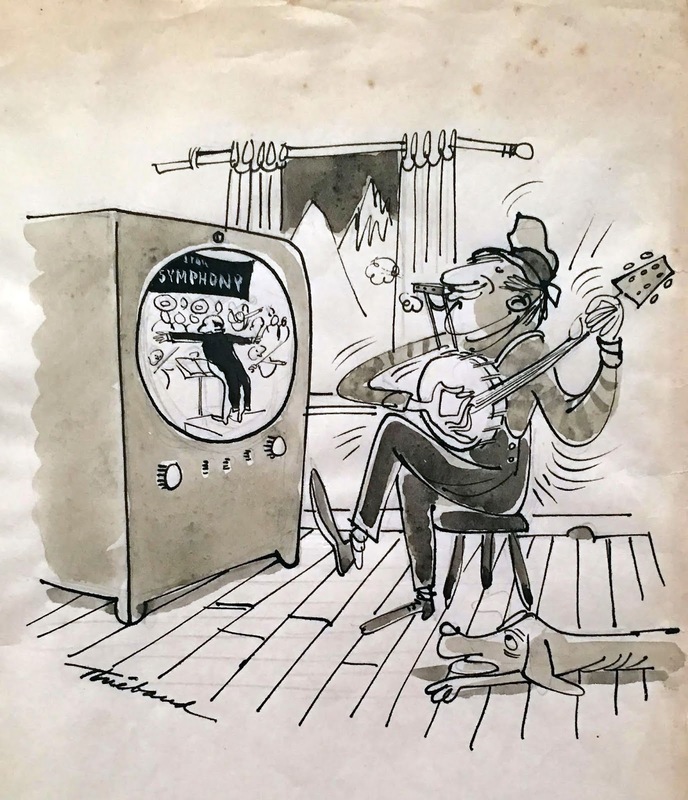 The display began with his early cartoons, and his wit brought a smile to my face. He was also asked by Wimbledon to attend their tennis matches and visually record the tennis players. Here I thought Norman would not appreciate being dragged through another museum, yet we would have both enjoyed this particular exhibit for our own separate reasons. 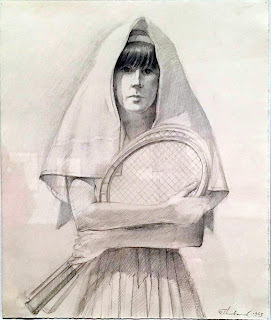 I was most taken by Thiebaud's quick sketches of people as they could have been drawn by the hand of my dad. It must have been the drawing style of mid 20th century art, and they were both wonderful artists of that era. I felt a close bond with Daddy, even if he was not with me at the museum. 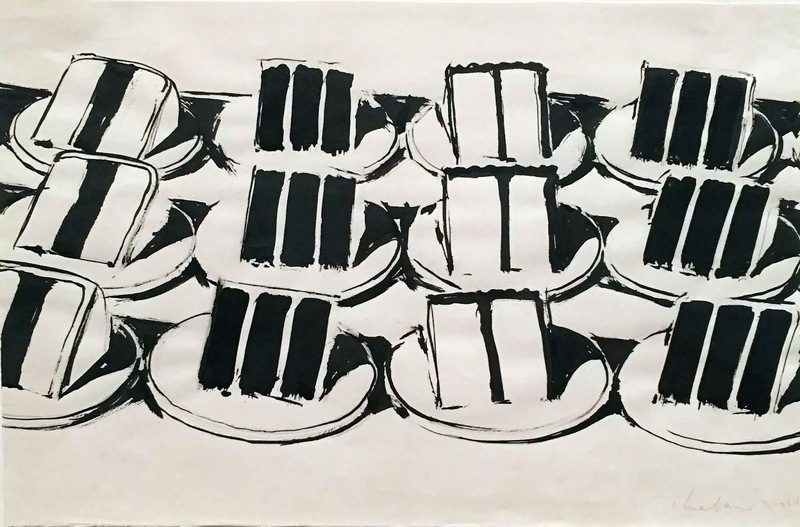 Thiebaud's obsession with food came from a fascination he had in the 1950's with displays of food in shop windows. The geometric patterns and colorful renditions of his rows of cake, candy and hamburgers eventually brought him fame. Seeing the quick pencil and ink sketches of Gainsborough and Thiebaud was almost like having a glimpse into the personal lives of these artists. Just like handwriting can reflect the personality of the writer, so can the drawings of an artist. A final exhibit, "The Magic of Handwriting," connected all the rooms of the museum in a well curated theme. Upstairs in the Morgan was a room filled with the handwriting samples of many people in history, world leaders, artists, scientists, and celebrities. A glorious and oh, so fascinating room to wander through. I examined each torn slip of paper that someone before me had written on as the most precious of all finds in any museum. Sigmund Freud wrote a letter to his 94 year old mom, giving her six dollars on her birthday. That was very typical of the small notes I took a long time to read and enjoy. 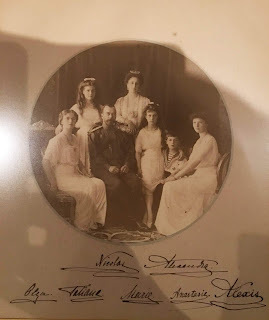 I witnessed the signature of the Grand Duchess Anastasia along with her imperial family days before their death, I looked at the shaky hand of an older Winston Churchill, the bold script of Andy Warhol, and the feminine scrawl of Marilyn Monroe. Hands down, the most beautiful writing in the room belonged to Benjamin Franklin. Those were the days. Kids are no longer taught script in school. 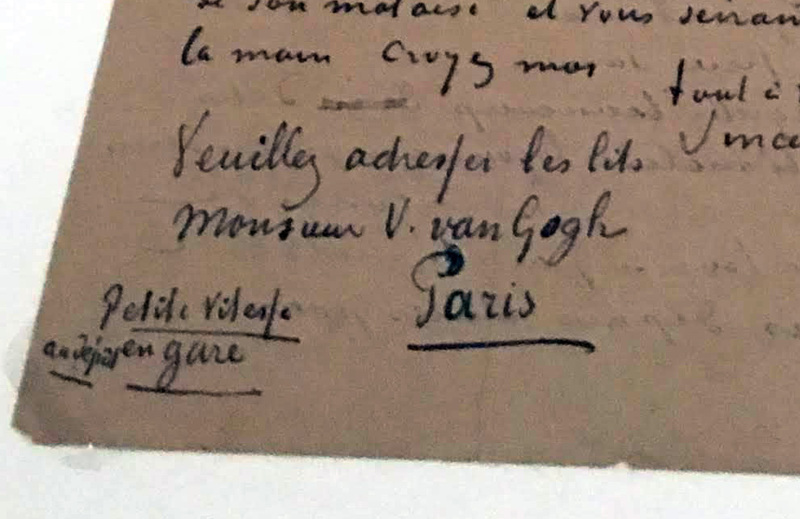 I was ready to record all these treasures with the camera on my phone, but what got my notice with the most glee was a letter written and signed by Vincent van Gogh. Shana Lindsey at Ranney once questioned my use of the lower case "v" for van and wanted it changed to a capital letter before report card comments were sent out. I was pretty sure my usage was correct, but I could never be positive that I was not following some other incorrect information on the internet. 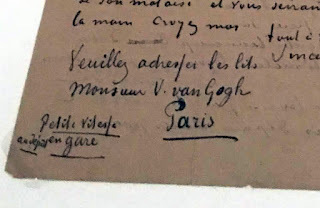 And as Vincent usually signed his work with just his first name, it was hard to prove my case. But here was a letter signed in full. Sure enough, it was written as Monsieur V. van Gogh! It was a joyful feeling to be validated by the artist himself. Best exhibit ever. I was inspired by the hands of many brilliant people and I was even given credit as an art teacher who knew her stuff. Not a bad day. 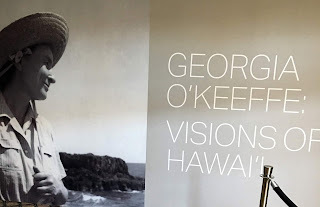 A gift from my thoughtful husband this year was a pair of tickets to see Georgia O'Keeffe at the NY Botanical Gardens in the Bronx. We spent a magical time together in one of the best weather days of the summer. And I got much needed inspiration for my own life as an artist. We began with a stop on Arthur Avenue for an Italian dinner. That made me nervous since we are talking about traditional Italians here, kind of like Sonny's of Hopewell Junction. Gluten Free or other crazy American nonsense served here? Not likely. 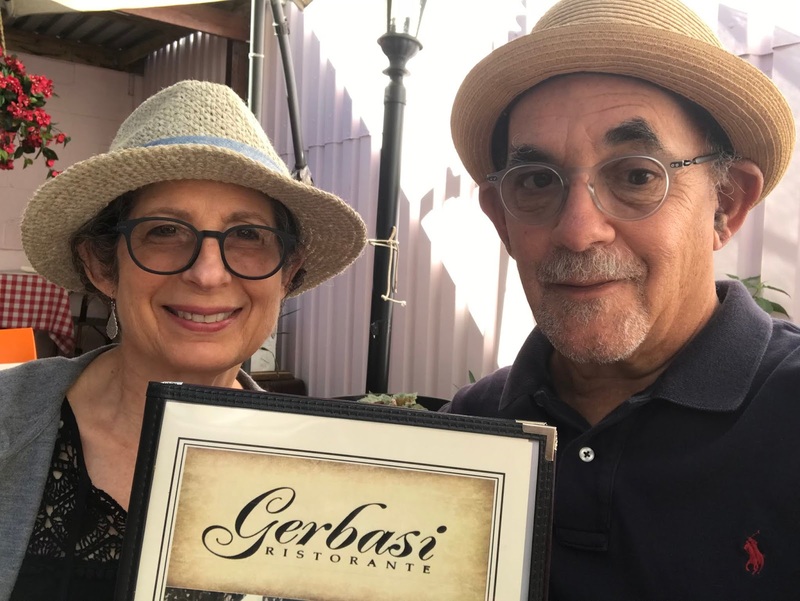 But a lovely dinner for me was possible, and it was discovered at Gerbasi, a lucky choice for us on the traditional avenue. 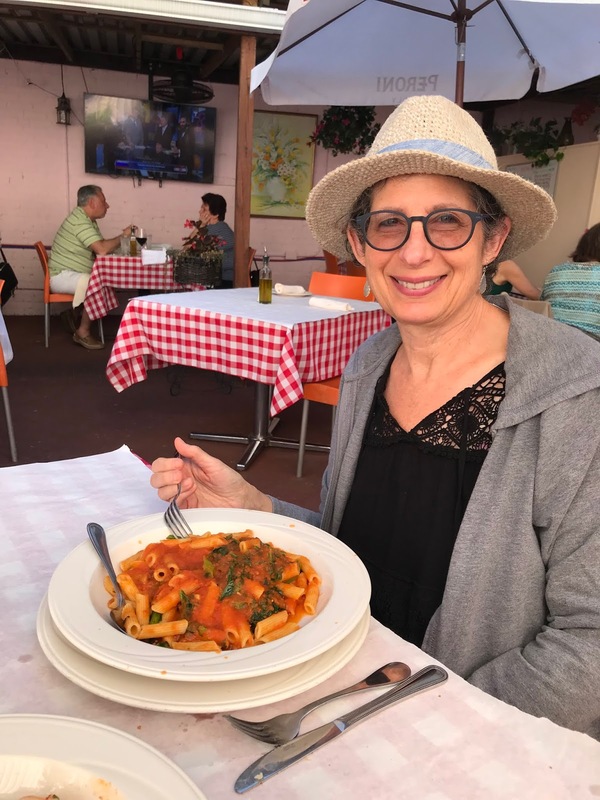 We dined in an outdoor patio with Godfather music filling the cool night air and it felt like we were transported not to the Bronx, but to Italy. My dinner was amazing, my date with Norman, lovely, and the waiter absolutely happy to put together a V/GF meal of my choice. Smart man. A happy customer means a returning customer bringing more friends to try out his Italian delights. The O'Keeffe exhibition in the Gardens was just as perfect. It was a small collection of her flowers and landscapes to fill my soul with art, especially after warming up during the day painting at my own easel. The Gardens surprised me at first since we did not see a single flower. We walked along a path looking at pretty green lawns, cool origami street lamps, rocky formations, and well groomed trees. This part of the Garden looked more like a public park than a place to pay to enter. After walking around the exhibit in the library, we stopped to listen to Hawaiian music and I even joined in a hula dance lesson on a great lawn. Imagine me dancing? Not in my wildest dreams, but I did swirl my hips! The Hawaiian theme continued in a conservatory with brilliant flowers typical of a tropical island. They really did a great job of transporting everyone into the world that inspired Georgia. And it will inspire me to face my easel again with renewed spirit and gusto. Andrea might just question the Hawaiian flowers I am inclined to add to her sweet Maggie's portrait! For the last 15 years I taught young artists in Ranney how to create an old fashioned selfie. We worked on circle portraits, Mona Lisa inspired selfies, Andy Warhol style portraits, paintings of portraits, drawings of portraits, photo manipulations of portraits and even iPad portraits. The smiling faces of our self portraits filled the gallery at school every fall and welcomed everyone to art. At home, I have the pleasure of being greeted by the smiling faces of my canine subjects, their gaze captured forever in an inquisitive pose on the surface of my canvas. To date, I have completed seven dog portraits, and each one was a joy to bring to life. 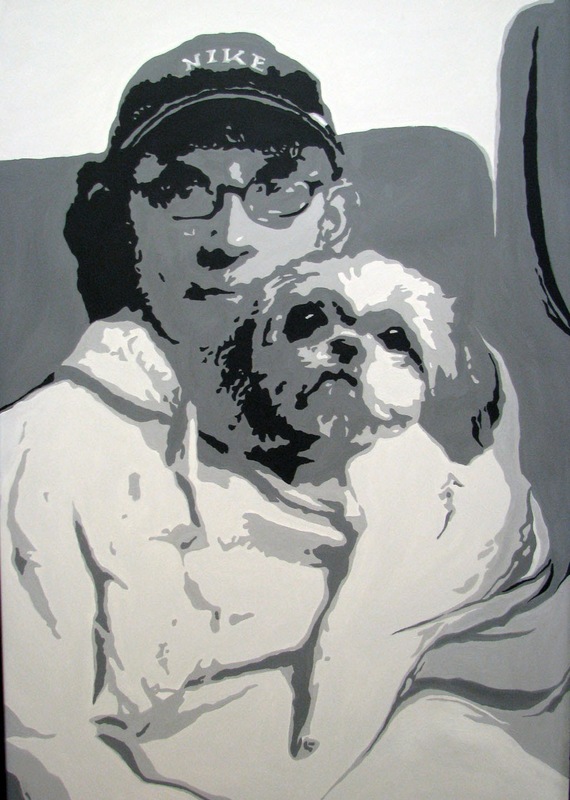 With each portrait, I learned something more about art, about painting, and about the unconditional love of an animal. I must have learned a thing or two with Zoe's painting above. When Katie tore off the wrapping paper from this gift, she began to cry and the dog started barking franticly at her image. I love that memory. I got something right. Babs' painting was done many years ago as a Father's Day present for Norman. It was a photo that I was playing around with on the computer and loved the Andy Warhol look of the image I manipulated. Beautiful picture of my husband. Babs is a large canvas and hangs in my kitchen. Dave the Dog was painted by request as a present for Erin's graduation. The chair gave me the most challenge but was fun to paint. I love the side of the big beagle mouth collapsed on the arm of the wicker chair. Great dog, great personality. King Dave. Tattoo was painted for Anthony at school. She was his son's dog that had recently passed away. I grumbled over painting the silly tiara over her head but when you do a commission for someone else, you give them what they ask for. Anthony never paid me for my services but he took care of my maintenance needs at school so I think it was a fair trade at the time. Hannah was my precious puppy. She was born in our house and was the cutest, most affectionate of all of Babs' puppies. She lived over 16 years and survived a lot, including the loss of her mother and the loss of an eye. 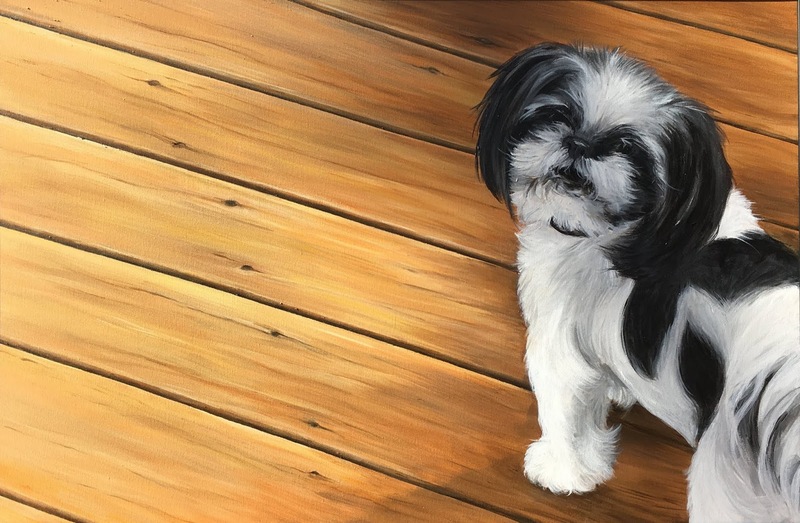 This painting was completed just before the end of her life and shows her on the deck looking up at me (with two good eyes). The wood grain was a delight to paint as I love realism and fine detail work. But painting Hannah was the epitome of all paintings for me. She came to life on the canvas. 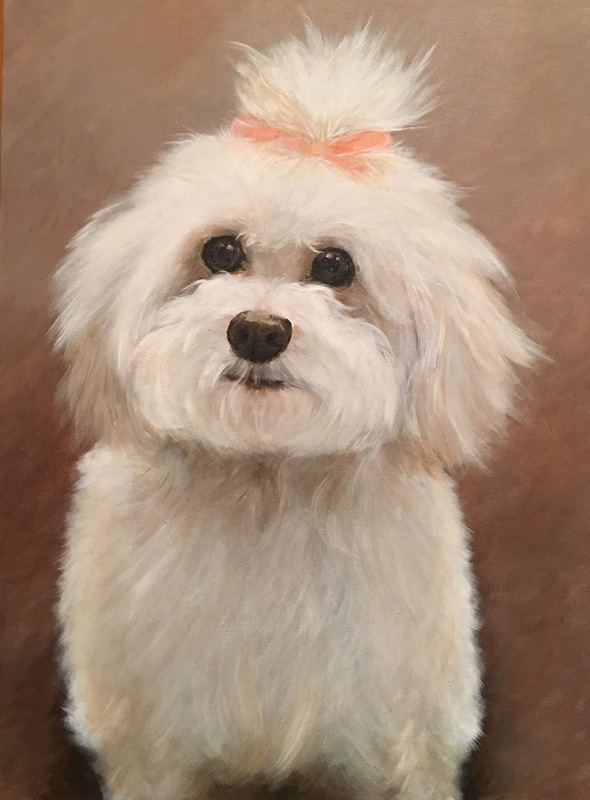 When I saw her expression in my brush strokes and when the fur felt so real to me that I could almost reach into the canvas and hold her soft body, I knew I captured her. Zoe is Katie's rescue pup. As a photographer, Katie was posting many great shots of this adorable pup and I had my choice of inspiration for this canvas. 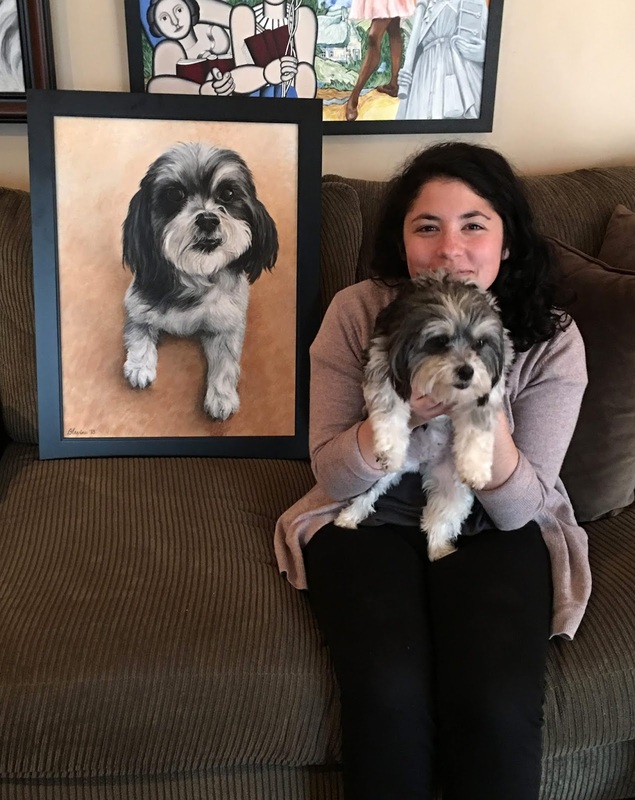 Zoe was painted in my new art studio at home and after completing her in record time, in a space I loved, I knew I had to figure out how I could retire this year and do this full time. Harley was Pat's request for Matthew's 30th birthday. This white fluffy dog made a post on Instagram after she was complete and the post completely ruined the surprise for Matthew (not aware that he was following me!). Of all my social media fans, though, I was most thrilled that Daddy liked this painting. I am 61 years old and I still look for approval from my father. He always will be my creative mentor and the greatest artist I know. 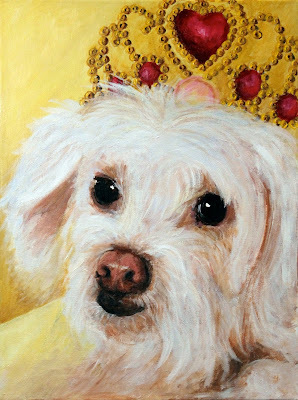 And finally there is Princess (what else would you name a poodle with pink undertones beneath her curly, white fur?). She was another request from Anthony at school. Anthony came to my art room with news that his mother-in-law's poodle died. So did Hannah. They passed away the same week and we were both in tears. I am still not sure if he will pay me for this one, but how could I refuse to paint her? We both love dogs. Princess was the first painting I completed as a retired lady. With time to kill, it only took days to do, not months of it sitting on my easel. 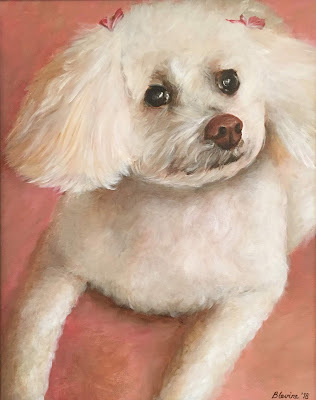 I don't just paint dogs, and in fact, some of my favorite paintings do not have any fur at all. Dog portraits have just been a theme for me lately. The first painting I get paid for, though, will be something to celebrate. So what's next? This is what Day 5 of retired life looks like. I am sitting in the den going through bags of stuff I brought home from Ranney. Some of the toiletries have been in my desk at school for 15 years. Do you think the Aleeve is still potent or the bandaids still stick? I am breezing through papers, cards and notes written by students, teachers and parents. Some of the letters make me smile, and almost all of them bring tears over memories that touch me deeply. I am anxious and uncertain of my future, leaving a job I was really proud of having. I had no business being a teacher without an education degree, but I think it was good to be an artist first. The kids got that and respected me for that, right from the start. They happily embarked on a long journey with me as we learned how to explore and create art together. What I could paint or draw, they learned how to paint or draw. My passion for children's book illustration, art history, technology in the arts, and applying paint on a blank canvas was never questioned. Next to me on the computer desk, is a bear dressed up as an artist. This bear was made for me during my first year at school as a thank you for painting the scenery for the Lower School musical. I must have made an impression on the staff for the principal's secretary to create something so special. And after they saw the work I was doing with the kids, they asked maintenance to hang another bulletin board in the hallway, just so I had another place to display artwork. Everyone gave me the freedom to figure out how to teach and what to teach and they rewarded me with awards for teaching excellence. As I left Ranney School, I was proud to say I was an art teacher. I said goodbye to close friends in the faculty and the most adorable young artists who loved art class. Six days ago, I lost my identity as an art teacher. It was my choice to stop and even as I know I was ready and it was the right decision for me, it still hurts. What will life look like now? Welcome to my blog! My name is Barbara Levine and I love to do anything that gets my creativity going. 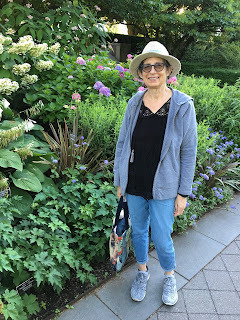 As a retired art teacher, I can be found painting at my easel, designing quilts at my sewing machine, blogging at the computer, or fiddling around with colorful recipes in the kitchen. My husband, Norman, and our three grown children inspire me everyday. This is my journey to discovering my creative soul. My writing journal, a place where I consider the art of the written word.